This review originally ran in the August 19th issue of Shelf Awareness for Readers. If you don't already subscribe to this awesome collection of book news and reviews, click here to fix that. You'll receive two awesome emails each week (Tuesday and Friday). 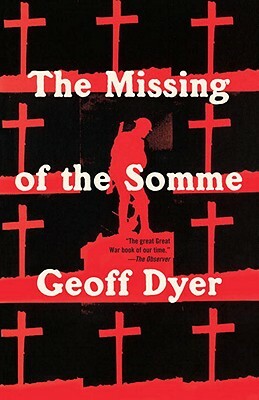 T here are countless books on World War I, and countless more on the wars following it, but The Missing of the Somme stands out among the crowd because instead of discussing strategy, timelines and numbers of the war, author Geoff Dyer (But Beautiful; Out of Sheer Rage) focuses on the remembrance of World War I. Though short, Dyer's treatise is incredibly thorough--he draws on his experience traveling to the cemeteries and monuments across Europe; surviving photographs, films, letters and journals; and his own family history to craft a story about the impact of war on the generations that followed it. In doing so, he covers most, if not all, of the many ways we use both to remember and memorialize the war and the losses in which it resulted. Ultimately, The Missing of the Somme shows us how much our need to commemorate an event is capable of shaping our memories of it, even as the event is still in progress. Originally published in the U.K. in 1994, this new edition is the first time The Missing of the Somme is being published in the U.S. As we approach the 100th anniversary of the beginning of World War I, and lose the last remaining veterans of the war itself, it proves a timely and important look at both the memory and memorial of the war so terrible as to be named The Great War. Note: Thanks to the publisher for providing a copy of this book to Shelf Awareness, and to Shelf Awareness for providing a copy of the book to me for review.